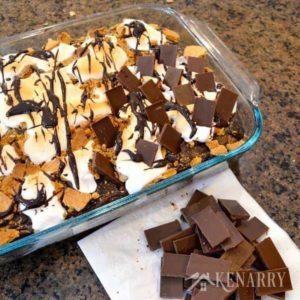 This recipe for S'mores Chocolate Fudge Cake is loaded with marshmallow and graham cracker. 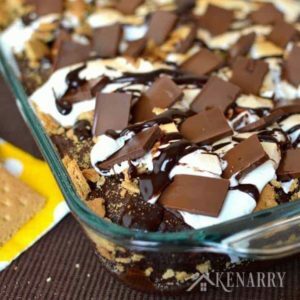 It's the next best thing to sitting by a campfire in the summer. Mix the chocolate fudge cake following the instructions on the box for oil, water and eggs. 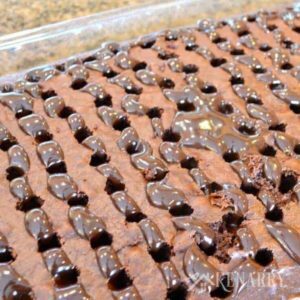 Pour the chocolate fudge cake mix into a lightly greased 9 x 13" glass baking dish. 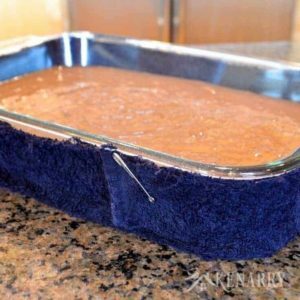 TIP: To help the cake cook evenly, run a strip of terrycloth from an old bath towel under cold water. Wrap it around the cake pan and secure it with a safety pin. This will keep the edges from cooking too quickly which causes the cake to mound up in the center. 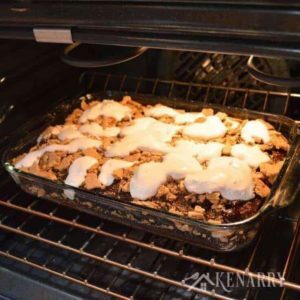 Bake at 350 degrees for 30-35 minutes or until a toothpick comes out clean. Let the chocolate fudge cake cool for 15 minutes. 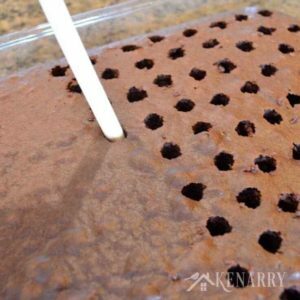 Use the end of a wooden spoon to poke holes in the cake about 1 inch apart. Heat the jar of hot fudge in the microwave for 30 seconds. Stir, then heat for 20 more seconds. Pour 3/4 of the jar over the top of the holes in the cake. 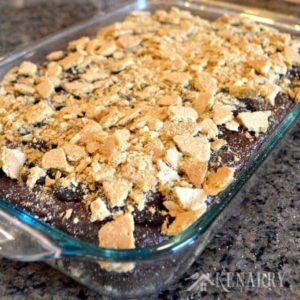 Crush the graham crackers and sprinkle over top of the chocolate fudge cake. Spoon dollops of marshmallow cream across the chocolate fudge cake. Broil on high for 1-2 minutes or until the marshmallows are toasted. WATCH CLOSELY so the marshmallow doesn't burn. As soon as you take the chocolate fudge cake out of the oven, drizzle the remaining hot fudge across the top. 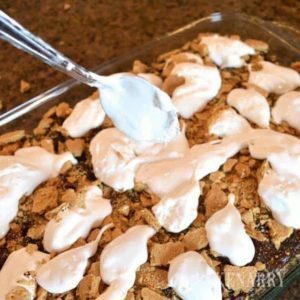 Insert chocolate bar pieces into the toasted marshmallow. 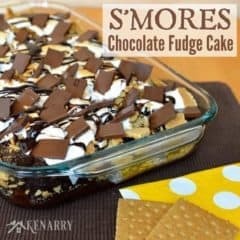 The warmth of the cake will cause the chocolate bars to melt slightly. Enjoy!